With an area of 1,648,000 square kilometers (636,000 sq mi), Iran ranks eighteenth in size among the countries of the world. 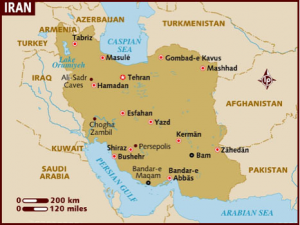 Iran is about one-fifth the size of the continental United States, or slightly larger than the combined area of the western United States (Arizona, California, Oregon, Washington, Nevada, and Idaho). Population: 76,923,300 (July 2010 est.). Highest peak: Mount Damavand, 5,610 meters (18,406 ft). Important Cities: Shiraz, Esfahan, Tabriz, Mashhad, Kerman, Qom, Ghazvin. Bushehr, Bandar Abbas. Neighbors: Turkmenistan, Republic of Azerbaijan, Republic of Armenia, Caspian Sea (North), Turkey, Iraq (West), Afghanistan, Pakistan (East), Persian Gulf, Arabian Sea (South). Languages: Persian (Farsi) and its dialects, Turkish, Kurdish, and Balochi (both Kurdish and Balochi are versions of old Iranian languages). Ethnic Groups: Persians, Azeris, Kurds, Turkmens, Balochis, Armenians, Assyrians, Jews, and Arabs. Shia Islam (90% of the population). Sunni Islam (8% of the population). Christianity (Armenian and Assyrian Churches, estimated 500.000 Armenians live in Iran).